If you haven’t been using the FamilySearch website for your genealogy research, you are missing out on a rich database that is completely free. This is the genealogy website run by the Church of the Latter Day Saints, using their huge archives of genealogical material stored out in Utah. It is important to sign up as a registered user on the website, to gain access to the scans of primary source material. Without seeing the original documents you will be limited to transcribed records. Don’t be afraid of registering on this website with a password. It is free, and there will be no spam or email from the Mormon church. Just last night I recommended this website to a complete stranger on a Facebook chat about Nashua genealogy. 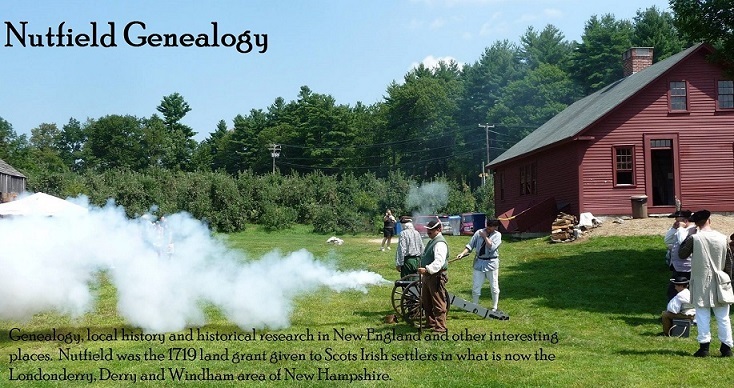 Along with obituaries she was able to begin her genealogical journey using these records and some New Hampshire vital records found on Family Search. To discover all the newly available documents online for the state of New Hampshire, click off “United States” on the home page, and then scroll down to “New Hampshire” on the list of states. You will see a list of nine databases available, ranging from Birth, Marriage and Death records to the latest entry “New Hampshire Town Clerk, Vital and Town Records, 1636 – 1947”. Note that out of the nine collections, six have a camera icon next to them, signifying that you will be able to see the actual scanned images of that collection. The town clerk collection was added on 7 November 2012. To see the collection, you must click on the line “Browse through the 402, 443 images” and pick the county, and then the town you are interested in reading. Since I live in Londonderry, I first went to the Londonderry records to take a peek. The records are not searchable, but you can browse to search for a certain year or for pertinent information. As volunteers transcribe these records, they will become searchable in the future, just like the vital records. There are tools on the left for manipulating the image to make it readable (to enlarge it, or rotate it, etc) and choices for saving images and printing. This is very important if you find a reference to your ancestor in the town clerk records. You will find elected officers, town meetings, poor lists, tax records, and even some vital records in the town clerk collections. If your ancestors and family members lived in other states or countries, this website is rich in records from all over the United States and all over the globe. I found baptism and marriage records from my husband’s ancestral village in Spain going back to the 1700s! Wow, what a great resource! Alhtough I wasn't really planning on spending half the day in front of the computer reading.... ;-) Thanks!